Peppermint essential oil is commonly used by aromatherapists for its uplifting, invigorating properties. The peppermint plant is actually a hybrid of the watermint and spearmint plants. The essential oil is produced by extracting the oil from the whole plant through a steam distillation process. The plant is native to the Mediterranean region but is currently cultivated in other parts of the world. Peppermint oil has been used for medicinal purposes since ancient Egyptian times. According to Ingrid Martin in her book "Aromatherapy for Massage Practitioners," peppermint oil has a cooling, anesthetic quality because of its high menthol content. It can make your skin feel chilly or cool when applied during massage. You can use peppermint oil in a foot bath to soothe tired, aching feet or use it to treat sunburn and inflammation of the skin. Martin states that due to its cooling properties, applying a tiny bit of undiluted peppermint oil directly to your temples when you have a headache can provide instant relief. Peppermint essential oil has naturally-occurring antispasmodic properties. It is effective for treating a wide range of digestive complaints, such as easing irritable bowel syndrome, cramping or stomach spasms and pain. According to Martin, peppermint oil has a antispasmodic effect on smooth muscle, so it is also useful at treating bronchial spasms and coughing. You can also use peppermint oil to relieve nausea and congestion. Peppermint oil is a natural stimulant that can increase your ability to concentrate during times of mental fatigue or stress. Inhaling the aroma of peppermint oil can help alleviate jet lag and boost your energy levels. 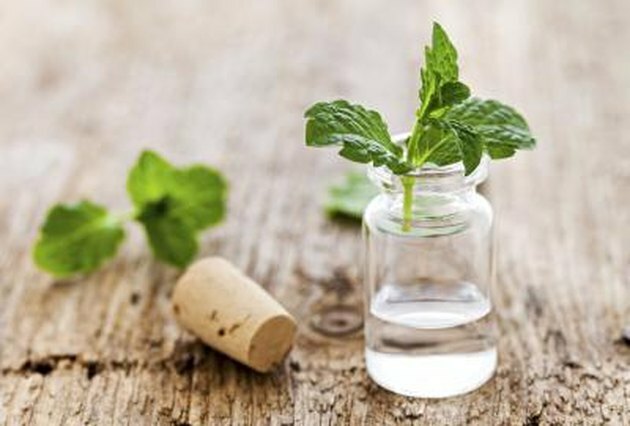 According to Janice Cox in her book "Natural Beauty at Home," peppermint oil can give you extra energy in the morning. You can make an energizing body rinse for use in the shower by adding two to three drops of peppermint oil and the juice of one lemon to two cups of sparkling mineral water or seltzer. Apply this mixture to your body with a sponge for a feeling of energy and invigoration when you take a shower in the morning. Rinse off and pat your skin dry. Studies at the Sense of Smell Institute confirm that peppermint oil has mood-elevating properties that make it useful for alleviating symptoms of anxiety and depression. It can help to boost your mood and relieve feelings of sadness as well as enhance mental performance and feelings of happiness. Due to these effects, you can use peppermint oil to ease stress, exhaustion and irritability. Dab a few drops on your temples to inhale the soothing aroma or burn the oil in an aromatherapy burner to promote an elevated mood.